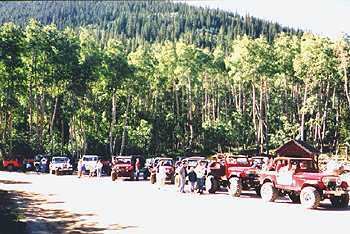 On Sunday July 29th, All-4-Fun 2001 trips begin with the traditional line-up at the staging area just east of the 'big top'. Yea!!!! The 1st trail of the week!! 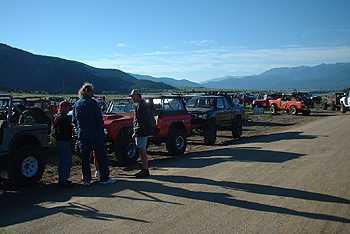 If you were lined up bright and early at (8:00am on staging line 2, you were going to run the Hancock/Tomichi Pass Trails just west of St. Elmo that day. 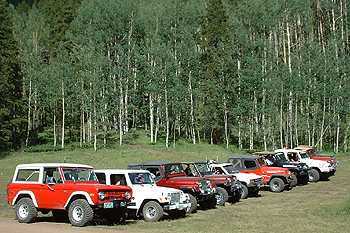 I (along with my jeepin-side kick Molly), led 22 rigs out of the staging area at 8am sharp on channel 14. The 22 Jeepers for the day included: Lee Eslick (CJ5), Don Singleton-'Betsy' (CJ7), Larry McClain (CJ7), John Hacsel (CJ7), Robbie Martin (TJ), Chris Potter with son Jason (CJ7), Rick Fitzimmons (Bronco), Bob Daniel (TJ), Greg Cunningham (CJ5), Ernie Kerbs (CJ5), Bruce Jones (Toy), Dennis Stoltz (Bronco), Louis Morosan (Bronco), Jason Contsmas (Ford p/u), Jon Contsmas (Nissan p/u), Fred Perry (TJ), Franklin Stucky (YJ), David Stucky (YJ), Steve & Carol Sipes (TJ), and finally Rob/Nick Evans (Toy). 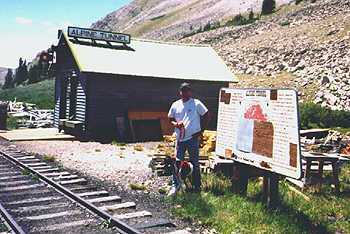 We headed up Hwy 285 north out of camp a few miles to the St. Elmo turnoff (Chaffee County road 162), which leads west up the long incline to the mouth of Chalk Creek and the white Chalk Cliffs. We stopped and aired down, and took care of business. 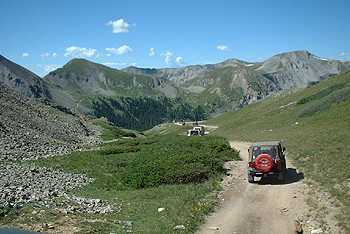 Off again, we climbed up the canyon to just south of St. Elmo where Chaffee County road 295 begins. The road is easy, though I wouldn't take a Corvette on it. 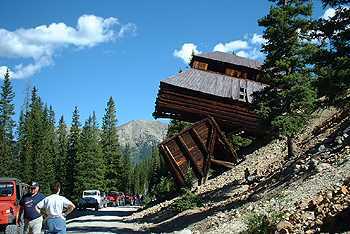 We worked our way higher and higher until we stopped to shoot some photos of one the Allie Bellie Mine buildings. 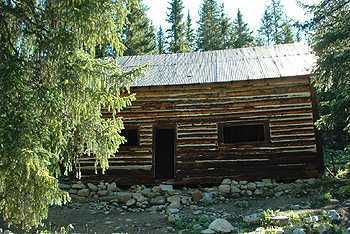 The ore loading building has since 1956, had sort of 'lost it's top', and sits quite peculiar. The county and Forest Service have deemed it safe to pass by. Due to the engineering structure, all the roof weight is sitting on the re-enforced ramp section of the building. 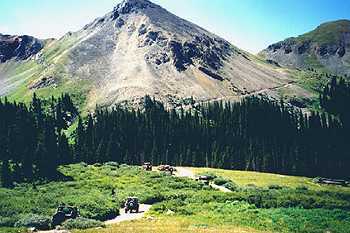 We headed on up to the turnoff to Hancock Pass (FR 266), and proceeded along a smaller jeep trail thru the trees to just above tree line. 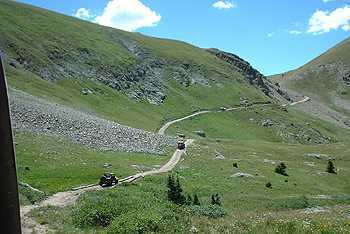 Here is a link to 4x4trails.net for a Trip report of Hancock Pass: http://www.4x4trails.net/db_view_trail.asp?trailNum=61. 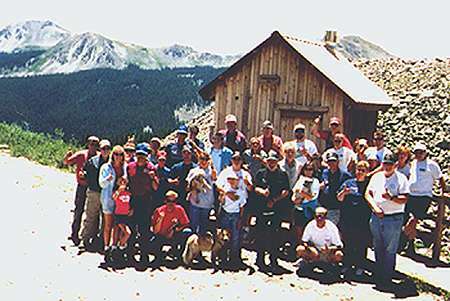 We had a stop for a 10-100, then started to head above tree line with views of the Chalk Creek Valley when the 1st vapor lock began. 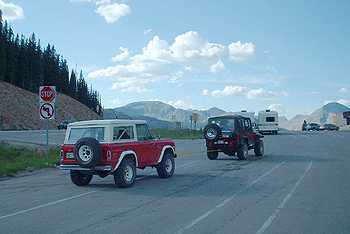 With the expertise of Fred Perry's team at Clemson 4Wheel, we had the situation taken care of, and we were on our way to Hancock Pass. Hancock Pass is about 12,200' and we headed down the other side to have lunch over at the Alpine Tunnel. 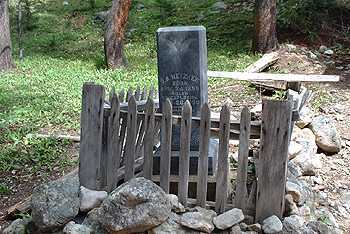 Once down off Hancock Pass, we reached the easy Forest Road 839. The next 3 miles are 'the most difficult 3 miles of track laid in the world', so the sign says. 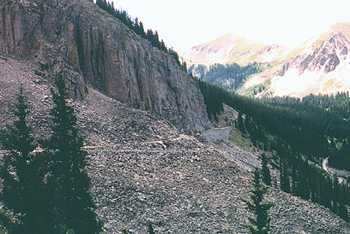 The road travels along 'The Palisades', in which the railroad cut right into the rock, and laid piece by piece without mortar stones to shore up the track. The Alpine Tunnel Road now runs vehicles over it 100 years later. We stopped at the Alpine Tunnel 'parking lot', which had room for about 20 vehicles (how many did we have??). Time for lunch at 11,400', and a quick tour of the Alpine Tunnel station and what's left of the tunnel after a brisk walk. Once turned around, it was down and back to the turnoff to Tomichi Pass. Seems another group from All-4-Fun were heading down Tomichi too....(do I hear a "Hoob-cha-cha-cha"), so we waited the the group passed us at the turn. Thumbs up to a fun group!!! 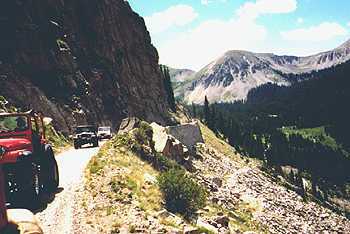 Tomichi Pass (FR 888) on the north side, is a tight narrow jeep trail with some off-camber spots of continually falling gravel rocks on the uphill side. We took it slow, and worked our way up to the top of the pass. Then the long descent into the Tomichi Creek drainage as the trail became easier in about 3 miles. 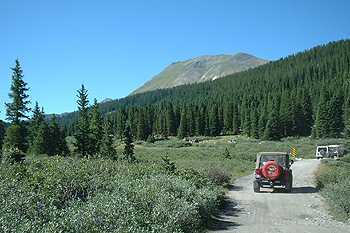 We took a break at the Tomichi Cemetery, and I gave some of our group the option to jeep some more or take this road down to Hwy 50 over Monarch Pass and back to camp. 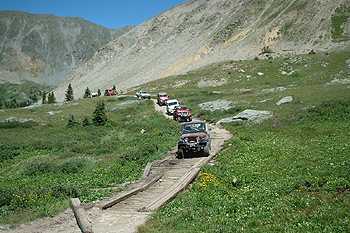 Only a few took up the offer, and the hearty jeepers forged on to try a different trail to Old Monarch Pass. I had a topo and a Forest Service map in hand so I tried FR 888.1C (on both maps). 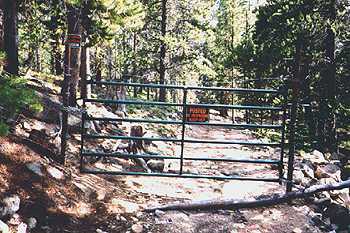 It was a tight ATV-like trail that had not been used in awhile, as we soon found out after a few fun climbs---the reason why,,,,,,,,,,,,,,a locked gate! 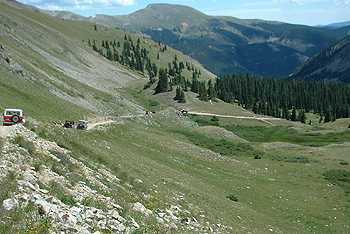 So we got turned around and decided to try another road just south of Whitepine that goes up Galena Gulch. This photo was taken down hill, it doesn't show at all the 45% slope!!. 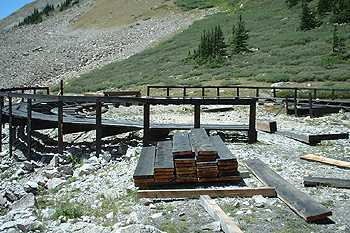 We lost a few more after that small detour, and the rest of us (about down to 12 or so) forged on up Galena Gulch. We soon found the road we were on (the other end of the locked gate--private mining claims? ), and I found FR 890 that headed south (the way we wanted!). 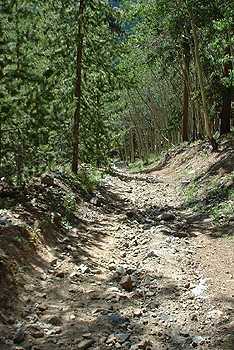 For about 4 miles, we followed this small trail thru Aspens and Firs. 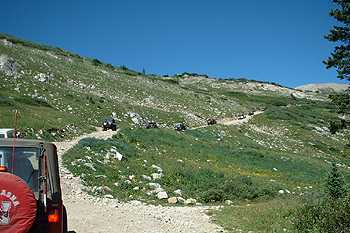 The trail had little or no rocks, so the higher low gears were getting used. 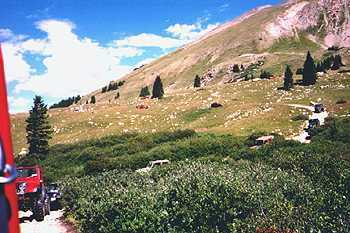 Finally, we reached the Old Monarch Pass county road, and it was a dusty race to the top, and down to Hwy 50 and camp. I had a fun time leading some great peeps! This was only Sunday! We have a whole week of jeepin' left, so time to gas up, get some ice, and head back to camp to be present to win some goodies at the 'Salida Appreciation night' at 7pm under the 'big top'!.